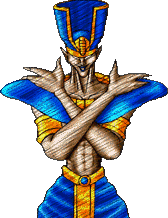 Alsion III is an undead ancient Egyptian with rubber-like limbs who uses electric and poison attacks. Unlike other characters from Breakers, in the 1994 prototype, Crystal Legacy, his name was unchanged. Fun Fact: Alsion III's alter-ego is known as Atoum. Atoum is a fan of ancient civilization who dresses up like a mummy. When he is in this form, he can use the techniques of the "Pharaoh Taijutsu" style. In reality, he is a descendant of Alsion III. If Dhalsim and Anakaris somehow had a baby... Alsion III would get popped out of somewhere. (Yikes, don't try to picture that.) 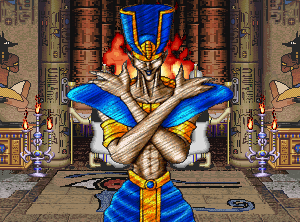 Alsion III also may take some inspiration from the pillar men of Jojo's Bizarre Adventure, mostly Wamuu. Alsion III is probably the weirdest character from Breakers Revenge (and that's not the easiest award to win either). In a nutshell, he's mostly a cringe-worthy design and just plain creepy to look at. He also resembles a generic hieroglyphic, and I get that's part of his design... but, in this case, I think hieroglyphics should stay hieroglyphics. 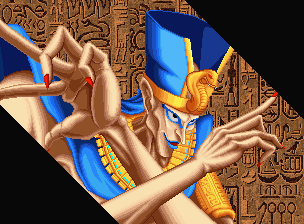 Most of the concept behind Alsion's moveset was indeed "borrowed" from the likes of Dhalsim, of course. There are "some" unique aspects of his design, I suppose... but he's too much of an awkward rip-off, filled with borrowed ideas from other characters, for any of that to matter much. This design gets a big "meh" from me. Where's Alsion I and II btw? Where they actually Dhalsim and Anakaris after all? Hmm.